Industry 4.0 is all about data. Data collected from machines, operators, systems, robots, products, customers, and every other process along the value chain. The data is captured, analyzed, and studied, and then it teaches us something about the chain. The generated knowledge drives deliberate actions relative to product lifecycles, customer relationships, and company revenue. Many large organizations layer AI on top of the data for autonomous predictive goal setting and decision making. Conversely, small manufacturers may be resource constrained and unable to gather the machine data, relying instead on machine interfaces and analogue monitors to guide the interaction. 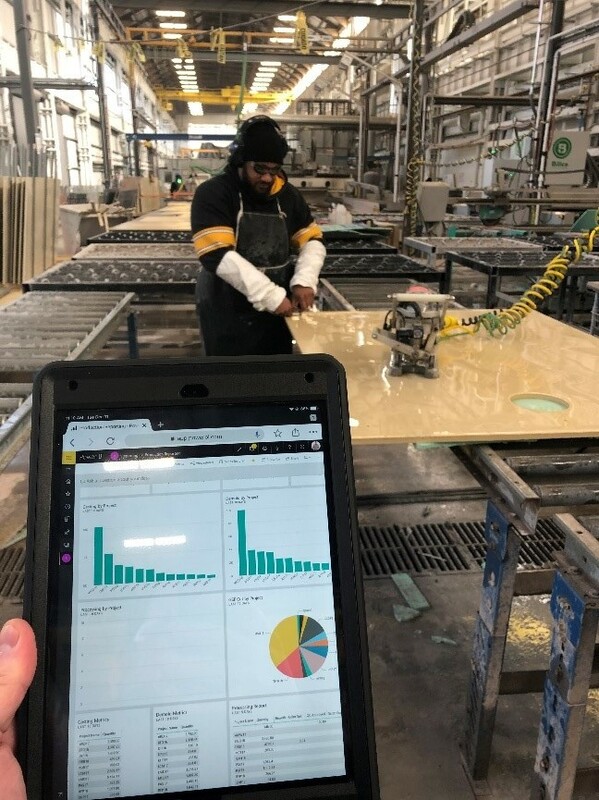 When faced with decisions about whether to extract and analyze data from a Manufacturing Execution System (MES) against investing capital in new assets, smart manufacturers need to find a balance and then achieve both. Every step towards Industry 4.0 maturity is forward! At TAKTL, we manufacture ultra-high performance concrete (UHPC®) façade panels for commercial buildings. Our facility is in Turtle Creek, just outside of Pittsburgh. We operate lean with a commitment to quality and design. Eighteen months ago, TAKTL determined to differentiate itself from International and domestic competitors with increased reliance on its cloud based ERP and MES system. TAKTL needed to make better decisions about its manufacturing operations in real time and faster than its competition in order to better serve customers. These following steps and actions were taken at TAKTL to help mature our use of information and technology on the plant floor. These steps may also serve as tips and methods that other small and medium manufacturers impart on their Industry 4.0 journey. Think Big, Act Small. Take a big chunk of work and carve it up into structured and staged efforts that are attainable. Use an Agile Framework like SCRUM to incrementally and intentionally work. Map a critical business process or operational area, keep your focus on it. Use machine and operational data that is already captured. Don’t spend time adding instruments, endpoints, and PLC’s if you already have data stored somewhere. Centralize the data repository. Pull data into it. Build a simple report: “Monthly Shipments” or “Weekly Yield”. Then build a second. And then build a third. Once you have 5 reports, publish them. Get feedback. Adapt. Change again. TAKTL chose to focus on daily processing statistics as its first foray into digitalization. The ad hoc reports highlight production results and quality checks from the core cutting and drilling operations. Over a couple months, the reports morphed into automated daily outputs, then into four times per day running logs, and now a real time collection of production charts and graphs. As a result of these efforts, TAKTL manufacturing adjusts as needed to meet the project demands with more accuracy. More importantly, our customers are seeing on-time deliveries, adherence to stringent quality controls, and the right material for their construction needs. The statistics were developed by an agile team of three people who split time against other day to day functions. The team scoped the effort, divided the workload, and met briefly each morning to scrum. Over many weeks of micro level sprints, the team generated a multitude of digital outputs. The end result is greater visibility across the shop floor of ongoing customer projects, visibility which affords managers and directors response time to adapt, adjust outputs, and fulfill increased demands. TAKTL is the exclusive manufacturer of A|UHPC® Architectural Ultra High Performance Concrete.